"Needles is the best software for attorneys"
It's simple layout. We have a lot of cases and therefore many files. It can at times be very difficult to locate specific cases in a pinch, or look up information for a client in real time. Needles database puts all cases in order and they can be easily looked up by last name if necessary. Not much to dislike, though I don't like the audible "you've got mail" every time i get a message. I assume I can just turn that off in the settings, though so it's not a concern. This software is slightly more pricey than many other softwares I have seen, but you definitely get the bang for your buck with it. 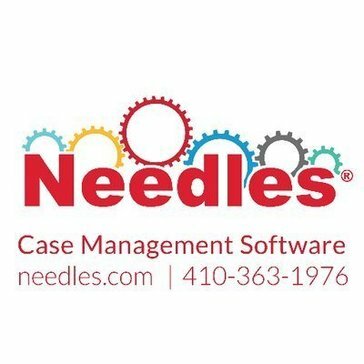 We are a small firm, but take many cases so needles is truly the best software for the job. Our office may be small, but we take on many cases. Sometimes it can be very difficult to locate a files information in a pinch, or when a client calls with questions regarding their case, it may be difficult to locate their file on hand. Needles makes that much more simple. Everything is laid out and we can keep track of case information and details with ease. "Needles is the best legal database software out there." Needles is set up in such a way that, if you input the information correctly, and you follow the protocol, you cannot miss a deadline or lose important documents. Had years of using MS Outlook for calendaring, contacts, and docketing. When my law firm installed Needles, it was mind-blowing. I took to it like a fish to water. I have kidded that Needles is my brain in software form. I LOVE IT! Needles gives the ability to track pretty much everything a law firm needs to track. The reports are incredibly powerful, and the ability to write your own reports is a great tool. Needles has certain areas where you cannot make user changes. It is few and far between, but annoying at times. You can add user entries to each "tab", but there is no way to align them automatically, leaving some pages looking a bit "wonky" or leaving you to make minute changes until your boxes line up as you would like. I have not used the new version yet and am hoping this will be one of the changes. I am really excited about the newer version of Needles. It looks much more like the software we are all used to using. It also seems to implement more user-friendly reports. Needles is a database for law firms. It is perfectly suited for this purpose. It is mind-blowing the information that can be tracked and the deadlines that can be watched with this software. "One of the most versatile Case Management Software"
This application got restructured from the old legacy with some amazing features. It gives a centralized place to track all your cases, and it makes it super easy to keep track of everything case related, emails, events, tracking all the activity with your clients. What documents need to be sent/share based on the caseType. I think the team has done an amazing job, making all the law firms life easy. The team is slow on the updates. As the industry is catching up with then new technologies and new platforms. I think they should really invest in that. Also, performance of the application can also be improved. Improve performance, update the software with the new features. It has been used to help with CASE management. Civil litigation cases were mostly ported to the application. It is still in the nascent phase but very useful. "A basic product for a law firm, but may require supplementation." I've used Needles at several different law firms. I like the messaging system and integrated calendars. It's very helpful and handy if everyone in the firm uses it each time he/she enters the case. I dislike that certain administrators can access and delete messages and case notes. Anyone can make a mistake, but, from my experience, some people use this delete feature to their own benefit in somewhat devious ways. Law firms need this type of product. But, be weary about who has access to all its features. I've always used it for case management. The first firm that I used it with had been utilizing the software for years. At the next firm, it was only brought on a month or two before I joined, so I saw that it made a considerable difference with case organization and management. Prior to the firm using Needles, case notes were all over the place (in work and private e-mails, in typed notes, even text messages). "Needles makes managing my cases simple and organzied. " I love the checklist that reminds me to do anything that is due on a case. I set reminders so nothing slips through the cracks. It is difficult to learn how to navigate it when you first start, but they offer training. Give yourself some time! After you get used to it, you see the benefits of using this management software everyday. You will feel on top of your cases. There are no deadlines missed and every case gets the attention it needs every day. when searching for a name, if not spelled exactly right, it will return no options. They should show results for similar. A;lso I don't like that you can go into other peoples messages. this solves the problem of case organization and calendaring. Needles is easily searchable with an ability to customize your case type. Reports are easily spit out to an excel sheet or .csv. This is great incase you need to do a mass mail off. You have to purchase the amount of licenses you think you’ll need. If for some reason you have more people than liscenses you get kicked off or someone is odd man out. If you’re a data stickler or report nerd; this is the software for you. You solve the need for physical files aside from absolutely necessary hard copies. I.e. signatures for contracts. However you can enter dates or check boxes to show things have been completed. There is also the ability to add SOL and have a task list of things that need to happen with a specific case by a specific time. "Rock solid case managment software." Needles is stable, runs quickly, and does almost everything I need. The software base is a bit dated and it is not visually appealing. Needles is gear toward usage in plaintiff's personal injury firm. Needles is used to drive the work in my practice and keep us in a proactive mindset. I love the way that Needles keeps us organized and tracks our work. The setup of documents requires a little more time that I would like. Keeping client info organized and in one central area is essential. "Needles is a great Case Management program to have!" I love the records request tab! It is one of the best features in needles. Needles is a great program to use to stay accountable and on track on each client's file. It is easy to learn and you don't have to be very tech savvy to use it. Being able to stay organized with each file and on top of what needs to be done and when it needs to be done. I love the Value tab where we can keep track of business expenses, medical bills, liens, etc. Tickler system it is set up to our needs and creates a list every morning that can be printed for ease in going over tasks. You really have to pay attention to what client within a case you are working or you end up putting medical specials on the wrong person. Needles solves our needs in managing our cases efficiently allowing us to close cases faster and realize profit sooner. Lots of categories, easy to run reports, easy to customize reports. Customer service is great - very responsive to all requests for assistance, very helpful. Task list - not crazy on how it's generated would rather be able to input a code to call up the case on the next status. great for reports - settlement reports, e-mail lists, active cases. It's made life easier to run reports to check on things. This programs keeps each clients deadlines separate and organized. You can create a macro basically and it calculates all the deadlines for you. Its a great way to store information- its extremely easy to retrieve data... especially when clients are on the phone waiting for information. There is a notes section.. and the program reminds you to put in missing information. We were able to stay organized. I use this for case management. It really is great to have every task on your checklist and set for certain dates. It is easy to find information and generates several documents. Makes my life way easier! The only negative thing that I can say is that the person who trained us on the program didn’t give us much j fonon all of its capabilities. I e learned 100% more than what the Needkes trainer taught us on my own. Keeping information easily accessible and the ability to add different tasks to the checklist. I've worked with Needles for years and there has never been an update. Their "help" function is an FAQ that does not cover all the questions. This software could do so much more. A mobile app would be a great idea as well. It's useful but it could be so.much.better if the company just put money into improving it. Still a decent option for organizing your stuff. "Personal Injury Law File Organization Tool"
I like that this is a specific product for law firms to organize cases electronically. I wish that this program would work with Microsoft products and not just Word Perfect. This is a great product to store law firm files and work through the claims and litigation process seamlessly while streamlined with a shared drive folder for each client. The checklist helps set reminders for each case entered into needles. * We monitor all Needles reviews to prevent fraudulent reviews and keep review quality high. We do not post reviews by company employees or direct competitors. Validated reviews require the user to submit a screenshot of the product containing their user ID, in order to verify a user is an actual user of the product. Hi there! Are you looking to implement a solution like Needles?